* It’s called dirty but its actually clean. It starts with a refreshing burst of spearmint and herbs (tarragon and thyme). * Projection is strong for the first hour or so. People around you will be smelling herb garden. * Sometimes I get lavender or licorice in there, sometimes I don’t. * You can tell this is marketed to guys since it comes as a ‘body spray in a Windex-looking bottle.’ The body spray is a little more minty and sheer with less emphasis on the herbs. * The EDP (not body spray) is pretty linear and calms down after about an hour. The spearmint and herbs quiet down a little bit and are joined by sandal wood in the base. * “Dirty” is said to be a reference to the “Italian Shower” – jumping out of bed wearing the same clothes and just spraying cologne to cover body smell. I guess this scent would work for that situation. Summary: I find myself becoming more and more of a Lush fanboy. Their products and scents are great quality, have solid longevity, and are priced fairly. You get great value for your money in a Lush store. I love Dirty and would recommend trying the associated products – especially the springwash and the toothy tabs. The springwash will wake you in the morning with a tingling mint. It reminds me of CO Bigelow Menthe. The toothy tabs will be covered a future review, but are basically baking soda tablets that you crush up and use as toothpaste. I can’t vouch for the hair cream (for obvious reasons) and i wasn’t a big fan of the shaving cream. 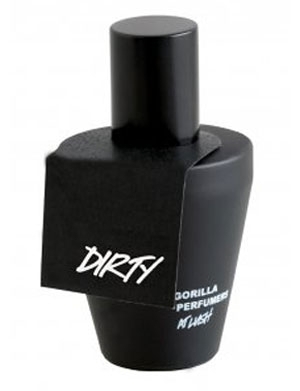 Guys, check out Dirty for a fun and refreshing summer fragrance. If you spray this on at least an hour before you get to work, it would be office-friendly. If you spray it on in your car before you walk into the office, your coworkers will look at you strangely. Victoria at eaumg.net recommended using the Dirty body Spray as room spray – and at 19.95 for 6oz, I would agree it does work for a multipurpose product. Her Frug named Frink seemed to like it even more. If you are planning to use Dirty as solely a skin scent, go for the longer lasting EDP. Lush Dirty is available at Lush stores and on the Lush website. *Disclaimer – No disclaimer needed – I bought a full bottle. Seriously, the body spray is awesome at neutralizing frug odors in the home, lol. I will keep that in mind if I ever get a pet… scary thought.